Cruising and racing have one thing in common they both require sails that will give the best performance within a budget. Selection of your sail and cloth depends on a number of factors - like boat size, aspect ratios, whether you race or cruise (or both) and your budget. Cruising requires sails that are able to withstand a range of conditions but are unlikely to be driven hard for extended periods, therefore our Cruising Series range of sails offer the optimum solution. If Racing is a significant activity this calls for a more robust sailcloth to tolerate the additional stresses that you place on your boat and sails – this also applies if you are a Cruiser who takes part in club racing. For these activities our Performance Series range offers a good balance between cost and performance. Offshore Cruising requires that extra bit of performance and durability for which our Endurance Series range of sails should be considered. Similarly an enhanced performance from lighter stronger sails with ease of handling is also achieved with the Endurance Series. For the ultimate in Racing our range Racing Series is the ideal choice to get first over the line. 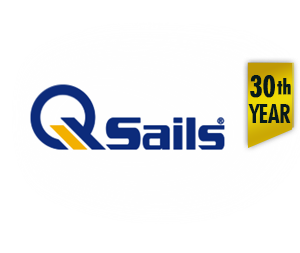 At the top end of the range Q Sails offer D4® MEMBRANES Sails (Incidences Technologies) for Performance, Racing and Super Yachts – these high specification and performance sailcloth provide the ultimate choice for large sails in arduous or highly competitive conditions.